Torta de Barros / There are 3 products. 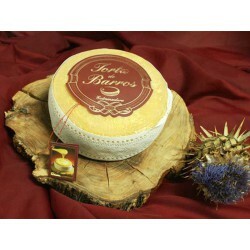 Torta de Barros is a pecorino cheese soft cheese made from raw milk. Soft and very personal flavor, somewhat acidic with explosion flavors of herbs and an elegant bitter aftertaste produced by the plant roots. Strong and intense aroma. It comes in formats of 440 grams, 750 grams and 1400 grams.